So much anticipation and excitement I felt in the wait for my cousin and her family to arrive from Australia. After 9 months in Nepal, I was ready to be a tourist with them. 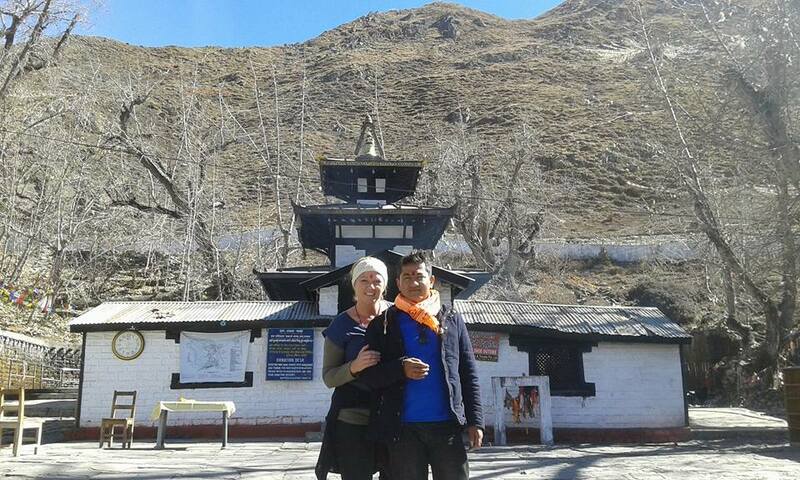 Govin and I had arranged to take them to Jomsom and Muktinath trekking. A first for us all. Feeling reasonably fit and healthy after much walking due to the petrol crisis and life in Nepal requires walking for many reasons, I was eager to get out in to nature again and walk in the mountains. Driving up to Jomsom in the Jeep took us around 10 hours, after the the occasional seat exchange, to prevent car sickness and the flat tyre about 7 kms out of Jomsom. Which we danced and chatted excitedly to keep warm in the zero temperatures in the early evening. The next morning we woke early and managed to find cappucinos (wow! 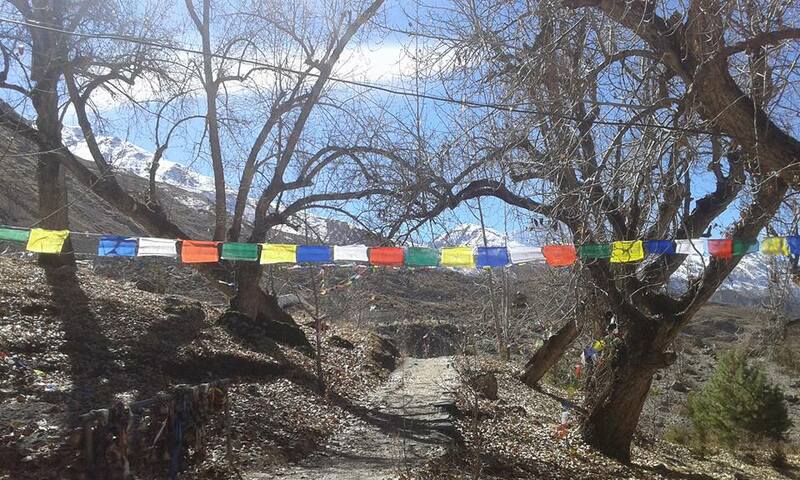 a real treat in these parts) and after breakfast walked out of Jomsom. 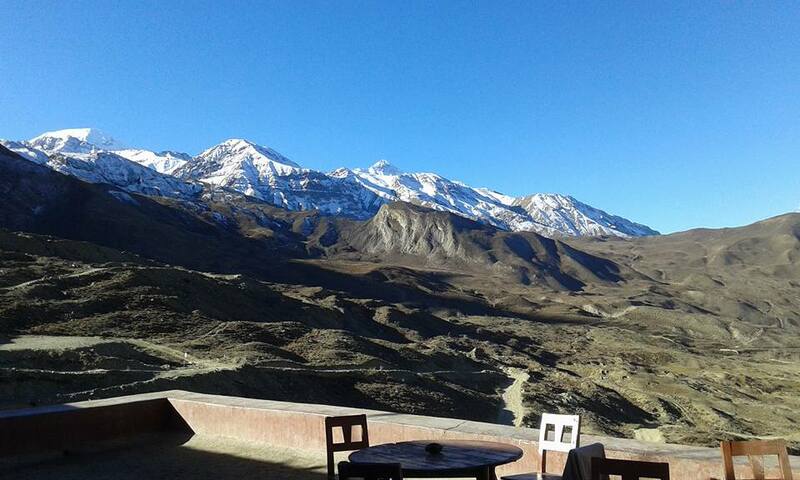 To try and describe the terrain and environment here is almost impossible…. A winding valley between some of the highest white peaks in the world, looking like they were so close that you could reach out and touch them, yet they were definately out of reach for amateur hikers like us. The Valley was actually the amazing Kali Gandaki river bed that in the Monsoon flows fast brings the water down the mountains. Now it is the dry Winter season, so it was huge expanse of black pebbles and rocks that in parts was easily 3 kms wide. The lower terrain reminded me films I’d seen showing the landscape of the moon or Mars. A desert or barron land with the occasional shrub, not much can grow out here. The weather is a series of extremes. Anything living out here is resilient, tolerant, patient and extremely hardy. As we walked further into the Mustang region, the animals, plants and people seemed to get smaller. Houses changed and looked more Tibetan in their appearance than Nepali and the people also looked more Tibetan. The language according to Govin was slower and drawn out Nepali… he giggled often at the way they spoke to him. Being here was like being in another country only about 250kms from Pokhara. The first day we walked 15kms mostly on the flats and river bed, until we reached Kagbeni a cute little village just at the bottom of the accent to Muktinath. Feeling optimistic and a ravenously hungry we had a great lunch and prepared ourselves for the 2nd half of the day. As soon as we left Kagbeni with our Momo and Dhal Bhat filled bellies, I noticed the air getting thinner. The way out of the village was a steep accent and it slowed our pace considerably, having no choice, we adjusted to the lack of oxygen available at this altitude. As we slowly walked the winding uphill trail we seemed to venture more into barren land, thinking we only had 2 hours left of walking, we stayed optimistic, resting regularly to regain our breath. Five hours later we were still walking, omg, at this altitude we were stopping every 10 steps and breathing so heavily, starting to feel dizzy and our legs were exhausted, it seemed the lack of oxygen had started to fatigue the whole body… It was now dark and using the moonlight we slowly walked the last 400 metres, taking us about 40 mins instead of 15mins… haha, we were exhausted flopping ourselves through the doorway of the first Guest house in Muktinath and regaining our breath. Its funny how the altitude can affect so many things, my appetite was non existent, my head felt dizzy and I felt slightly nauseated. Forcing some food down, I then went to sleep with thought that maybe I wont wake up…. apparently that can happen here to some people, however I was so tired at this point I wasn’t fazed by the thought and it seems nobody else was either. In the morning we woke early to the most spectacular view… Honestly its something pictures can not capture. The feeling of being surrounded by snow capped peaks that seemed to touch the sky, with air so fresh and crisp, dressed in layers of yak woolies and sipping warm tea, it was like being in heaven. The temple was still another 20 min walk up the hill and Govin got up early to go and pray like a good Hindu and then we ascended upon his return, him guiding us up the many steps past the bells and prayer wheels, following the winding stream that rushed past us down the mountain, no doubt to meet up with Kali Gandaki somewhere down below. underground in this area, whilst receiving blessings from their beloved Shiva. landscape falling away from you and the white mountain peaks in all directions. each giving a combination of 108 Padas in total. Watching a group of young men doing exactly this was so exhilarating that I wanted to join them, however I was mindful and confused about whether Id be being disrespectful, so decided to watch instead and then after they were finished I ran my hand under every fountain, splashing the icy water all over my head, arms and chest…. So refreshing and revitalising, it reminded me of swimming in the Bass Coast in Australia near my home Phillip Island, the feeling of immersing yourself in cold water really does have a cleansing and revitalising affect and it made me think of home and how much I miss my island. One of the things that I felt as I reached the temple was silence, except the sounds of nature and rushing water. It was a strange silence, it was like their was a presence watching over us, an energy holding us, like you could just be…. Im not sure if it was the running water or the amazing views but a deep emotion came over me of connection and realisation of oneness, it took me by surprise as I stood on the step and just breathed it in and allowed myself to shed a tear. Maybe it was the altitude, but I felt like no matter what is ahead of me in my life, that I am being held and guided… I felt gratitude for the breath of life. After spending some time at the temple we descended and I immediately felt invigorated and ready for the day ahead. 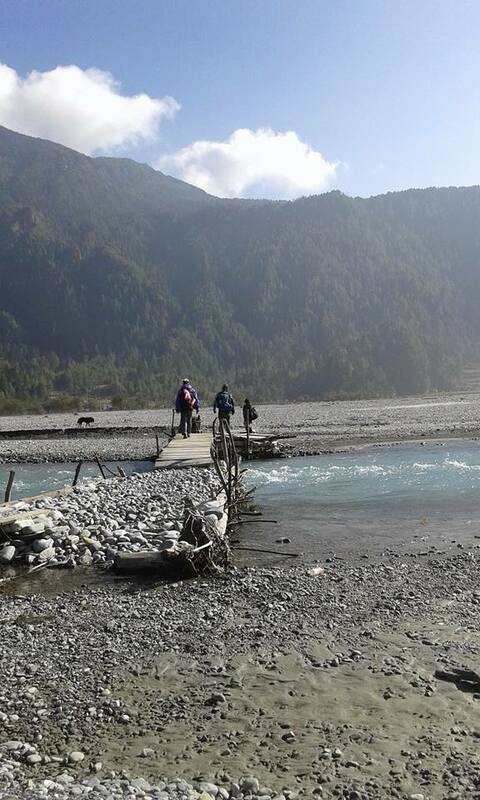 We now had to head back down the mountain to Jomsom and continue walking back along the Kali Gandaki River towards Beni. This would take us the next 4 days. 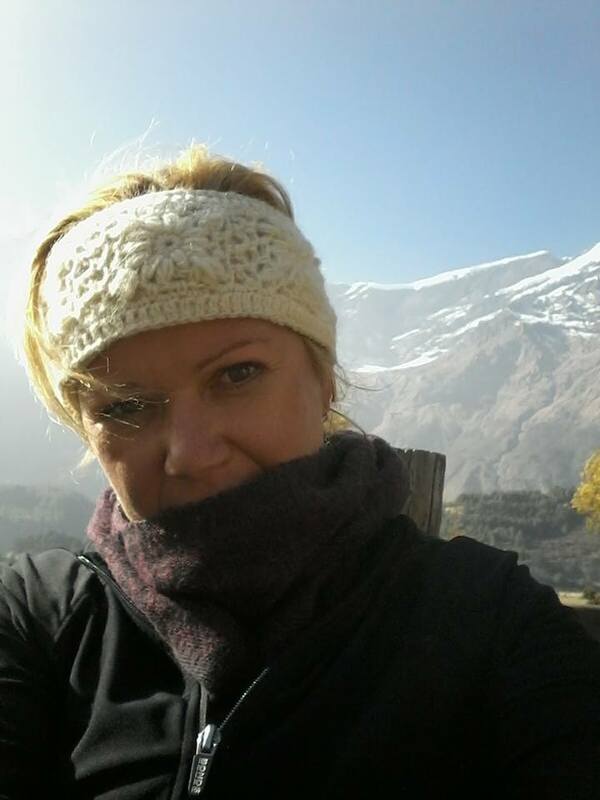 So with each step I felt a bounce and found myself almost dancing down the mountain toward Jomsom, I felt assured and my feet just seemed to find the path. We walked through mountain villages and so much of our walking was done in deep thought and meditation as the landscape slowly changed and the views continuously inspired us as we walked over and through and around the trails following Kali down to the village Ghasa. By the time we reached Ghasa on our 5th day of trekking after many freezing nights and fresh days, I was ready to board the bus, my knees starting to become aware of their lack of cartilidge. The local bus was packed to the roof literally, with bags and people. Nepali take advantage of every available space and for the next 3 hours to Beni, we bounced around on the 4WD track down along the edge of cliffs not more than 3 metres wide in bits in a bus with babies and old people all hanging on to whatever they could reach. At least 10 or so sitting on the bags in the isles and leaning on each other to support themselves. Arriving back in Pokhara later that evening I felt a soft sadness, as the realisation that I only had 12 days left in this country of temples, gods and crazy bus rides and most of all I would be leaving the most amazing young man that I have ever met. Australian Immigration don’t appreciate human smuggling so we have to be patient and do all the paperwork necessary for Govin to join me in Australia. At this time Im full of mixed emotions, the excitement of coming home to my family friends and my island to the grief of leaving a place that has literally changed my life and perceptions about my life… So much has happened in such a short time and Ive learnt so much. Another chapter of life written and all I can do now is reflect on the past and focus on the future and writing the next ones. Im excited to come home and share many things and look forward to reconnecting to my work, supporting and inspiring people to follow their dreams, to not be afraid, to have courage and that sometimes following your heart can bring challenges, however the challenges, far out way the suffering of feeling powerless and stuck in a life that does not fit who you are. Challenges are just opportunities to shift your perceptions…. Sometimes we think we know and as soon as we think this, you can be assured the universe will remind you that you don’t know anything at all… haha.